Why are women more likely to suffer from depression and anxiety? Why are women more likely to suffer from neurocognitive disorders like Alzheimer’s disease? ​What is the impact of obesity on brain function in females? Our laboratory has three primary lines of research that are geared towards addressing our overarching research questions. We are equipped to address these questions with the help of an outstanding multidisciplinary research team including collaborators at the University of Cincinnati and other institutes. We believe that team science is the best science! These studies use in vivo and ex vivo strategies including rats, brain specific knockout mice, transgenic mice and humans (in collaboration with Dr. Dorn) to understand how various factors including stress and/or age contribute to depression and anxiety in males and females. We rely upon a number of behavioral (social and non-social based) and neuroendocrine assays as well as cellular/molecular endpoints in the brain and periphery for these studies. These studies use in vitro, in vivo and ex vivo approaches including various cell lines (in collaboration with Dr. Privette-Vinnedge), rats, brain specific knockout and transgenic mice to identify novel targets and treatment strategies for Alzheimer’s disease in males and females. We are specifically focusing on the interaction between gonadal hormones and certain genes in Alzheimer’s disease risk. In addition, we also focus on metabolic dysfunction as a contributing factor to this neurodegenerative disease. We rely upon a number of behavioral assays that tap into the socio-affective, sensory and cognitive components of this disease as well as genetic, cellular/molecular endpoints in the brain. These studies use in vivo and ex vivo strategies including rats and mice to identify critical substrates in various brain regions that: (1) regulate metabolic function and (2) link mood and/or cognition with metabolic function in females. 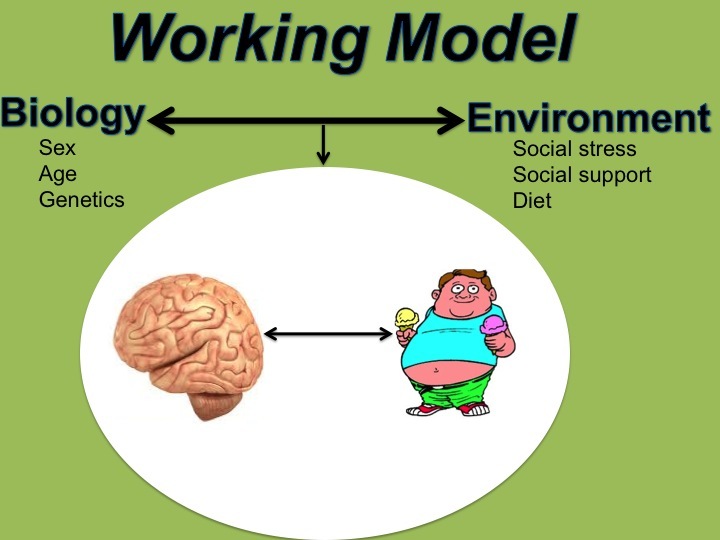 In addition, we investigate the impact of obesity due to various factors (diet, genetics) on brain (plasticity, mood, cognition) and metabolic health. We rely upon a number of behavioral and neuroendocrine assays as well as genetic, cellular/molecular endpoints in the brain and periphery for these studies. The ultimate goal of translational research is to transfer basic research discoveries into new or improved methods for diagnosing, preventing and treating disease in humans. Specifically, our research team seeks to identify novel treatment strategies (pharmacological and non-pharmacological) for these mental and physical health problems.